Okay, I finished the book yesterday, but due to my laptop not working whatsoever, I was unable to finish my post from Tuesday. Yeah, I sooo need to get my laptop fixed, I'm working on it. Anyway, I could not put this book down, of course I had to when I had to go to class. Stupid college. The book was sooo good, and of course it left a little of this and a little of that hanging to carry onto the next book. Rachel did manage to track down her boyfriend's killer with the help of her friends and she regained her memory back of what had happened that night Kisten died. That was a verrrryyy interesting chapter. Of course it was towards the end, one of the very last chapters in fact. But lots of other good stuff was going on, it was the holidays! After Christmas but before the new year. And whoa, a lot happened in those few days! There are also the return of a few characters that I was sooo not expecting, that was just great. They actually came from two of Kim's short stories, one from Dates from Hell and the other from Holidays are Hell, while the book does tell you who these characters are and where they came from, it does help to have read them. The title of her story in Dates from Hell, was Undead in the Garden of Good and Evil then the other story from Holidays are Hell is titled Two Ghosts for Sister Rachel. Reading them will be very helpful for when reading Kim's lastest release, it will give you the whole story, obivously, and not just the brief reference. And I won't say which one, but if you read White Witch, Black Curse you'll know, one of these characters might be back in the next book. 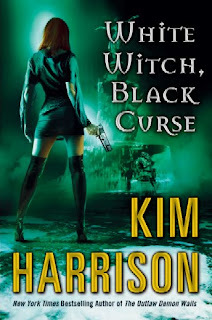 It doesn't take much for me to admit that I am addicted to Kim's Hollow Series, her characters are fresh and you can easily fall in love with them. Jenks, the smart-mouthed pixie, is by far one of my favorite characters, he has such a way with words--I'll have to leave it at that, if you want to know why I say this then you will have to read the series. For those of you who are new to the series, it is important to read the books in order, when I was new to the series I started to read the second one first by mistake and I was really confused with several references to past events. I forgot how far I got before I finally discovered that there was another book before it. Okay I haven't read it nor have I bought it, for 2 reasons as of right now. 1: Borders isn't open yet and 2: I have a class at that time. But as soon as it lets out that is my first stop! As the book description says Rachel is going to finally track down her boyfriend's murderer. This is the 7th book in the Rachel Morgan series and it has been one helluva ride so far. Rachel has had some bad luck in the past, a scheming boyfriend, making deals with demons, dealing with bad guys on a way too regular basis, becoming leader of her own little pack where there aren't too many werewolves, and oh the list goes on and on! But this series has everything in it, witches, demons,vampires-both living and dead, there is a difference! !-pixies and fairies, again there's a difference! !, actual elves, werewolves obviously, and oh again, the list goes on and on. There is tons of action in these books since Rachel is a runner for her own independent business that she runs with her vampire (living) and pixie friends. There are fight scenes, a little bit of romance, but not so much lately due to the plot of this book and Kisten's (the boyfriend) absence in the last book, mysteries, chase and tons of adventure. This is a truly wonderful series that I have been addicted to since day 1! Once she was a powerful Djinn. Then Cassiel defiled her ruler, Ashan, who tore her vey essence away and reshaped her in human flesh as punishment. Forced to live among mortals, Cassiel has found refuge among the Weather Wardens--whose power she must tap into regularly, or she will die. Rachel Caine's new series is absolute must read. For anyone who has not read her current Weather Warden series, which is another series that I highly recommend and will discuss in a bit, this new series is set in the same world! We even get to see familiar faces in the first chapter! Again, I don't want to give away anything from the book other than what the description says, but what I can say is that there is not stop action and so many mysteries to solve, just like in Weather Wardens. You never know who you can trust. And like Weather Wardens, the end leaves you craving for more. There was so much action taking place and we were finally learning new things about Cassiel, for she is a mysterious character as the novel is from her point of view. We don't always get the full details on why she acts the way she does, other than the fact that she was once a Djinn. For those who don't know Djinn are like genies, but not with the whole 3 wishes thing like in Aladdin. Djinn were once servants to the Weather Wardens and were forced to do things for them. In short they were treated like slaves, but not all Wardens were cruel to the Djinn. Very few were cruel, others even thought that the Djinn should be free to come and go as they please and help whenever they can and if they could. Djinn are powerful beings that can do many things such as manipulating the weather along with Wardens and manipulating the structure of almost anything. Hate that red jacket, well with just a touch a Djinn can turn it into a black jacket. Don't want the jacket at all, the Djinn can remove it from you with just a look! I have to give kudos to Rachel for incorporating my favorite line from one of my favorites movies within the novel. It has nothing to do with ruining the plot of the novel so I am just going to say what it is anyway. Chapter 14, page 261: "We're going to need a bigger boat"!! Major kudos to you Rachel! For those who may not know and if you don't, shame on you! !, this line comes from the movie Jaws. The original one, not any of the sequels which did not hold up to the original! Great movie by the way that I highly recommend. Steven Spielberg worked really hard and long on this movie and had many difficulties with the mechanical shark and that is why he never worked on any of the sequels. The Weather Warden series, currently at book 7 with book 8 to come out later in August 2009, stars Joanne Baldwin a Weather Warden, she controls the weather, there are also Earth and Fire Wardens who control said properties. The Weather Warden series must be read in order to fully understand the story and the story is very long, to explain one novel and then go to the next would give stuff away that I really do not want to do if anyone is interested in reading the series. This is a really great series that is sadly coming to an end next year with the last book. So if you feel like reading up on it this would be the time for there is not much time left for new books to keep you back. Since I was running out of room I decided to just make a new post for the Weather Warden series that I mentioned in the post I wrote above this. 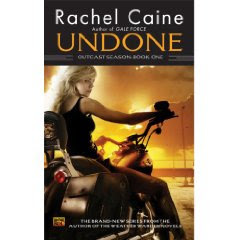 So if you want to read about Rachel Caine's newest series that is set in the Weather Warden's world go up to the next post and read on. It is there that I mention this series. The Weather Wardens series is fantastic! It's about the Wardens who protect us from Mother Nature's fury. We are not supposed to know about them, but....somehow the info got leaked into 7 books, soon to be 8 in August 2009 and finally, and sadly, ending in 2010. As I said in my previous post, this is a series where you must read from book 1 to book 7, then 8 and then 9 next year! Note: There may be some SPOILERS from book to book based on its descriptions. Especially if you get the exact one that is found on the back of the book. There may even be SPOILERS in these shortened descriptions as well, so reader beware. I did however, try to eliminate some of the major spoilers with the "SPOILER" input. Again, you can easily find the information I withdrew from the author's website or at other book-based websites. Mistaken for a murderer, Weather Warden Joanne Baldwin is hunted down and killed by her colleagues. SPOILER, she senses something sinister entering earth's atmosphere--something that makes tomorrow's forecast look deadly. Weather Warden Joanne Baldwin protected the human race from monster storms MAJOR SPOILER! She's throwing the dice to stop an infinitely powerful, deeply disturbed kid from bringing on a new ice age. When the truce between the Wardens and the mystical Djinn starts to self-destruct, Weather Warden Joanne Baldwin is forced to choose between saving her Djinn lover, saving her abilities, and saving humanity. Rogue Weather Warden Joanne Baldwin must rally the remnants of the corps against the Djinn, who have SPOILER, and a cranky Mother Earth, who's about to unleash her full fury against the entire world. After SPOILER, Joanne Baldwin lost her memories thanks to SPOILER the djinn -- and they will remain lost forever unless Joanne can recover her identity -- and destroy the demon who is impersonating her. After her lover David, a Djinn, asks Weather Warden Joanne Baldwin SPOILER. Unfortunately, there's a devastating earthquake in Florida. She can't ask David and his kind for assistance because the cause of the quake is unlike anything Joanne has ever encountered. Finally finished my book for school and immediately started on this one. Carrie Vaughn's latest Kitty novel picks up right where book 4 left off. Unfortunately for any newcomers this is a series where you need to start off at book 1 to fully understand what is going on. 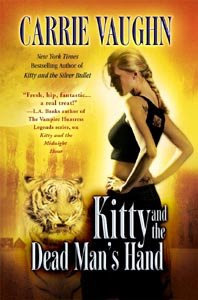 This is book 5 and book 6, Kitty Raises Hell is due out February 24 2009. According to Borders though, it is not "supposed" to be out until March 1 2009. Kitty goes to Vegas in this novel with her mate, but naturally trouble finds Kitty, it even crosses state lines with her. I don't want to give too much away, the back of the book description above pretty much gives the necessary information without giving away too much. Again, if this sounds interesting to you, then I highly suggest reading the other books first, all of which were fascinating! Kitty Norville is a midnight-shift DJ for a Denver radio station--and a werewolf in the closet. Sick of lame song requests, she accidentally starts "The Midnight Hour", a late-night advice show for the supernaturally disadvantaged. The country's only celebrity werewolf, late-night radio host Kitty Norville prefers to be heard, not seen. But now when she's invited to testify at a Senate hearing on behalf of supernaturals, her face gets plastered on national TV. Kitty's been in hot water before, but jumping into the D.C. underworld brings a new set of problems. And a new set of friends and enemies, including the vampire mistress of the city; an uber-hot Brazilian were-jaguar; and a paranoid, Bible-thumping senator who wants to expose Kitty as a monster. Kitty quickly learns that in this city of dirt politicians and backstabbing pundits, everyone's itching for a fight. Okay none of that was very original, I just typed in what was on the back of the books so I don't give too much away and not leave out any of the finer details. I did leave out a tiny bit from book 3 because it gives a spoiler to book 2 that I didn't want ruin for anyone. Of course if you find the book elsewhere or an excerpt elsewhere you'll find out what the "censored" line was. It's nothing too big, but still it was a pretty intense moment in book 2. So if you're looking for a good werewolf book to read then Carrie Vaughn's series is a great place to start. All these books I listed are out on the shelves and as I mentioned earlier book 6 Kitty Raises Hell is due out February 24 2009 or March 1 2009. Depending on what website you look to info for. Either way, it should be out around that last week of February.